St. Mark’s is pleased to welcome artist Beth Waltz and her collection for our latest art installation. Her pieces will be on display from July 8, 2018 through September 8, 2018 with a reception held Friday August 10 from 6:00 pm – 8:00 pm. Exhibit hours are Tuesday-Thursday from 9:00 am – 4:00 pm. Beth Waltz designed many more “stained glass trees” for St. Mark’s than we had room to display. 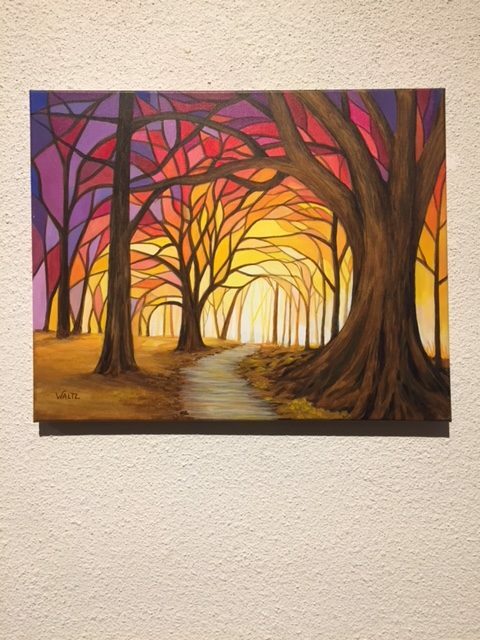 If you like her art but did not see just the right color or combination, all the trees can be viewed at https://fineartamerica.com/artists/beth+waltz/trees. Any design may be reprinted on canvas, on bags, pillows or other home decor items. If you wish to purchase the original or one of her pieces, contact her at beth@waltzdesign.com to see if it is still available. Beth Waltz grew up in Elgin, IL without the influence or direction of any artistic relatives or friends, yet she was drawn to creative endeavors from an early age. Beth has three associates degrees in graphic design, and although she does still create commercial art and has dabbled in a wide variety of mediums, she currently almost exclusively paints with acrylics. Each of her artworks is a one-of-a-kind original, created with concern for durability and intended to last the test of time. You can visit her website at www.waltzdesign.com and email her at beth@waltzdesign.com.